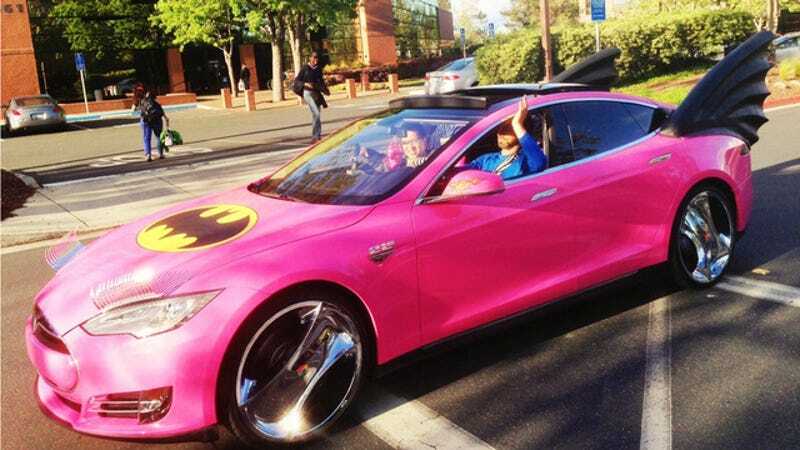 Employees at Google may have just pulled off a prank that is simultaneously brilliant and visually horrifying after they apparently transformed their boss Sergey Brin's Tesla Model S into this pink eyelash-sporting Batmobile monstrosity you see here. As reported by a Google employee on his Google+ page (that's apparently still a thing), Search Engine Roundtable, and a thread at the Tesla Motors Club forum, Googlers played an April Fool's joke on their company's co-founder by decking his Tesla out in a disguise even the Joel Schumacher version of Batman wouldn't be caught dead driving. If this is true, I hope for Brin's sake that that's a vinyl wrap and not a paint job. The rims are sweet though, he should totally keep those.